Will surprises ever cease. Not only are we having a “white Passover” thanks to a freak snow shower on the eve of Chag Aviv, but we are hearing praise for President Barack Obama from unexpected quarters. The Zionist Organization of America (ZOA) today praised several important, positive statements made by President Barack Obama’s during his visit to Israel. In speeches delivered in Israel, President Obama testified to the millennia-old Jewish religious and historical bond with the land of Israel; the success of Zionism in transforming the Jewish people into a genuinely free people in their own land; called for Hizballah to be labeled by all as a terrorist organization; called for the Palestinians to accept Israel as a Jewish state and for Arab nations to normalize relations with Israel; and affirmed America as Israel’s strongest ally and greatest friend. [T]o continue to act as if [President Obama] is an enemy of Israel is both counter-productive and tactically wrong, and will only alienate from both Israelis and American Jews those conservatives who continue to act in such a manner. If Obama makes a wrong move, then call him on it. But encourage him to – as a friend of Israel – do what has to be done to secure the future of the Jewish state. We tend to get exercised by Holocaust denial, and for good reason. The refusal to accept the facts that part of the ostensibly civilized world went on a genocidal murder spree over the years 1938-1945 and that most of the rest of the world didn’t much care implies a certain regret that the genocide failed. In the end, though, deniers of that historical truth are-at least outside the Arab world-generally marginalized, recognized as either mentally deficient or depraved. Each time we clapped for the old Hungarian lady who spoke about Dachau, each time Elie Wiesel threw another anonymous anecdote of betrayal onto a page, I eyed it askance, thinking What did you do that you’re not talking about? I had the gut instinct that these were villains masquerading as victims who, solely by virtue of surviving (very likely by any means necessary), felt that they had earned the right to be heroes, their basic, animal self-interest dressed up with glorified phrases like ‘triumph of the human spirit’. I wondered if anyone had alerted Hitler that in the event that the final solution didn’t pan out, only the handful of Jews who actually fulfilled the stereotype of the Judenscheisse (because every group has a few) would remain to carry on the Jewish race-conniving, indestructible, taking and taking. And, finally, there’s a more subtle challenge to the memory of the six million, though in a way more disturbing for its subtlety. Call it Holocaust fatigue. 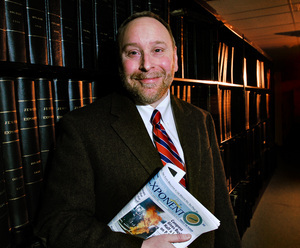 Like some recent blogging by a reporter for the Jewish Telegraphic Agency, the premier American Jewish news service. Reporter blogs allow journalists to let their hair down a bit and offer reports that are more informal and personal than the writers’ official, supposedly objective products. The blog entries are thus windows on their writers’ minds. This particular writer, who produced a short, straightforward report on the recent Daf Yomi Siyum HaShas, used his blog platform to present his followers a “real time” series of observations from MetLife Stadium on August 1. Meant to be droll and funny, they came across, at least to some readers, as more smarmy than savvy. The writer doesn’t spell out his precise feelings about the references, but in the context of the “sassy” tone of the blog, it’s pretty clear that he found them somewhat… tiresome. The Holocaust has, sadly, been misappropriated in the service of various purposes. But if ever there were a proper and fitting place for invoking the designs of the would-be destroyers of Klal Yisrael, indeed, of Judaism, then a mammoth Jewish celebration of Torah is it. “Yehei Shmei Rabba” declared by 90,000 Jewish voices in unison was thunderous testimony to the fact that our enemies, again, have failed and that both our people and our Torah have emerged from unspeakable national tragedy faithful and strong. I don’t mean, of course, to in any way compare Holocaust fatigue to sewage like Holocaust denial and Holocaust derision. The latter are evils, the former an unfortunate problem. But it’s a problem, a deeply discomforting one, all the same. The following assertion has been up occasionally in the conservative blogosphere: That Iron Dome, the system that successfully defended Israel from a recent spate of Gaza-based rocket attacks, was launched under the aegis of President George W. Bush. But that turns out not to be correct. In fact, Obama more or less owns U.S. backing for Iron Dome. In March 2010, the Obama Administration announced that it would support $205 million in defense assistance to Israel for the purchase of up to ten Iron Dome batteries. Israel began developing Iron Dome in 2005 and it became a priority in 2007, but there’s no evidence that Bush gave funding for the project an advance nod. The Pentagon spokesman in this May 2010 Reuters report pegs the funding decision to the fall of 2009, when Obama was president. Ron Kampeas writes on JTA’s Capital J about Fred Karger an also-run in the Republican nomination for President who differs from the better-known also-runs in that he is still running. [Fred Karger] is determinedly cheerful although mindful that he is not going to get the Republican nod for president. As Tablet and others have reported, Karger — who is gay and Jewish — is set on moving his party toward embracing rights for gays. Still, Karger has shown greater staying power than Mitt Romney’s other rivals. He’s running ads embarrassing the putative nominee on cable news channels in California, ahead of next month’s primary. 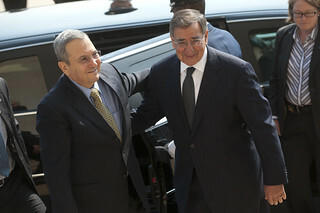 Defense Secretary Leon Panetta hosted Israeli Defense Minister Ehud Barak at the Pentagon today for bilateral discussions focused on Israel’s security and Iran. Panetta announced during the meeting that the Obama Administration will be providing Israel with an addition $70 million in funding for the Iron Dome missile defense system, which is in addition to the $205 million previously given. Panetta’s statement and reaction from JTA after the jump. The level of security cooperation between the United States and Israel has never been stronger. One important example of this cooperation is U.S. support for Israel’s Iron Dome short range rocket and mortar defense system. I was pleased to inform Minister Barak that the President supports Israel’s Iron Dome system and directed me to fill the $70 million in assistance for Iron Dome that Minister Barak indicated to me Israel needs this fiscal year. My goal is to ensure Israel has the funding it needs each year to produce these batteries that can protect its citizens. That is why going forward over the next three years, we intend to request additional funding for Iron Dome, based on an annual assessment of Israeli security requirements against an evolving threat. This is part of our rock solid commitment to Israel’s security and comes on top of approximately $3 billion in annual security assistance for Israel. The U.S. has already provided $205 million in assistance for that system, and operational batteries have already proven effective in defending against rocket attacks on Israel earlier this year. 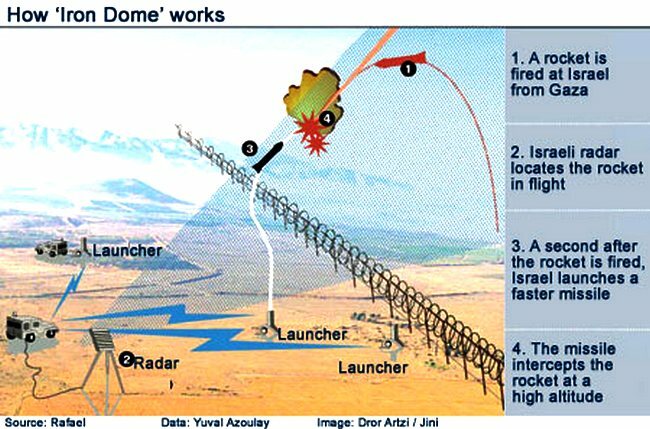 Iron Dome has already saved the lives of Israeli citizens, and it can help prevent escalation in the future. Minister Barak and I have been discussing additional U.S. support for Iron Dome, and in recent months our departments have been working closely to gauge Israel’s security needs and production capacity for that system. This is assistance that, provided Congress concurs, we can move quickly, to ensure no shortage in this important system. Meanwhile, we will stay in close consultation in the years ahead to ensure we are making necessary investments in this important system. Legislation under consideration in Congress, shaped in consultation with administration officials, would deliver $680 million to Israel for the system, which earlier this year successfully intercepted rocket fire from the Gaza Strip. The system was funded in part by $205 million transferred by the United States to Israel in 2011. Barak is in Washington to discuss with Panetta and Secretary of State Hillary Rodham Clinton efforts to keep Iran from obtaining a nuclear weapon…. Israel would likely seek to shore up its defenses against attacks on its borders ahead of any conflict with Iran, as Iran would be likely to pressure surrogates in the Gaza Strip and Lebanon to attack. The American Israel Public Affairs Committee also praised the Obama administration for its announcement. Israeli para-athlete Moran Samuel won an international rowing competition in Gavirate, Italy. The organizers weren’t expecting her to win, so they hadn’t bothered to secure a recording of the Israeli national anthem, “Hatkivah.” When Samuel found out there would be no anthem played when she was on the podium, she asked for the mic and started singing herself.